See the Disneyland hours January 2020 below to help you welcome in 2020 with a visit to the happiest place on earth - Disneyland. The holiday decorations stay up through around January 7 2020. For all of you wondering about the weather in January when you plan to visit Disneyland California, note that we do not have wind chill factor or snow days in Southern California. Most days in January are sunny but slightly cool, with cool evenings as the sun goes down around 5:00 PM. Sometimes it rains or even pours, so a light parka is helpful (or you can buy one at the park). Many times you will find warm sunny days! The crowds are pretty heavy during the Christmas to New Years holiday, so arrive early. This year New Years Day is on Wednesday January 1 2020, so expect crowds to thin out after that weekend or the following weekend, as some schools have an extended winter break. Martin Luther King Jr. Day is on Monday January 20 2020, and is another popular holiday weekend, as many schools are closed. Except for those holiday times, January is a pretty quiet time to vacation at Disneyland California Resort or Disney California Adventure park. 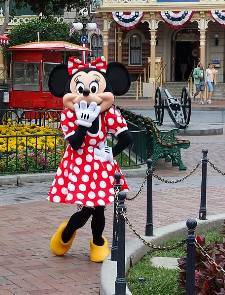 When are the Disneyland Park Hours for January? See the table below. The early morning admission hours are also shown. Disney published these only 4-6 weeks in advance, so if it says "tent" for tentative those are based on last years hours. We will updated when available. *Early admission hours for Disneyland (DL) or California Adventure (CA) theme parks are one hour before regular park opening time. Special ticket required for early admission. **Disneyland passports Signature (S), Deluxe (DL) SoCal (SC) and SoCal Select (SCS) are blacked on certain days. All passports are good unless listed here as blackout days.